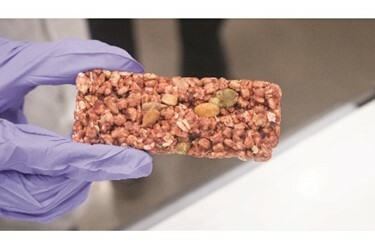 Enjoy Life Foods – a rapidly growing manufacturer of certified gluten-free and Non-GMO Project verified snacks – recently installed four X5C Compact X-ray inspection units from Loma Systems (www.loma.com) at its 200,000 square foot baking facility in Jeffersonville, Indiana. Chosen for its reliability, robustness and space-saving design, the compact machine is inspecting a range of allergen-free snack bars wrapped in metallized film for contaminants. Founded in 2001 by Scott Mandell, Enjoy Life is a wholly owned subsidiary of Mondelez International, which acquired the company in 2015. The state-of-the-art plant produces cookies, snack bars, chocolate bars, baking chocolate, seed and fruit mixes, and savory snacks which are free-from gluten and 14 common allergens. The product is supplied across the USA and Canada, as well as global markets such as South Africa, Israel, Mexico and Singapore. Enjoy Foods has installed the X5C X-ray system at the end of its packaging lines where it is inspecting wrapped solid chocolate bars and snack bars containing seeds, chocolate chips or caramel pieces. The X5C is operating at speeds up to 240 packs per minute, on a continuous 24/7 basis. Loma’s X5C model is developed for food manufacturers, processors and packers running multi-product lines who are looking to make the switch to X-ray technology for the first time. It is a compact yet highly functional system designed to reduce the cost of ownership of X-ray inspection technology by up to 30%. The fully specified X5C offers quality contaminant inspection using well-proven sub components and a streamlined design. Snack foods often fluctuate in density which can make it difficult to find foreign bodies and creates inspection challenges for manufacturers. However, Loma’s X5C not only detects physical contaminants, it also inspects for proper fill level, seal defects, mass measurement and component counts. It can also identify lumps of product including seasoning or powder. In addition, snacks that are packaged in metallized film or have variable product temperature and moisture content will have no effect on the detection sensitivity levels of Loma’s X5C. Aaron continues: “Loma recommended the X5C due to our limited production space, budget restraints and its ability to reliably and accurately inspect snack bars wrapped in metallized film. In terms of cost, the unit compares extremely favorably with other types of inspection equipment. The X5C is ideal for the detection of glass, calcified bone, rubber, stone as well as ferrous, non-ferrous and stainless steel metal in various packaging. It operates at line speeds up to 50 meters per minute and measures just one meter in length. It is capable of handling products up to 100mm (height) x and 300mm (width) but weighing no more than 3kg. In line with CFR21 part 11 traceability, Loma’s X5C is multilevel password protected for improved data management, which means the system can log events against individual operators. Produced from brushed stainless steel, it offers an ultra-hygienic design for easy cleaning, low maintenance and serviceability. A quick release belt can be completely removed without the need for tools and the belt tension can also be eased for cleaning. The X5C has sloping surfaces to reduce drying time and to stop food particles and washdown droplets from accumulating in crevices. For significant energy saving benefits, the X5C incorporates a detector array with a 0.8mm diode pitch. This provides a low power and self-contained high efficiency X-ray generator, resulting in the best balance of processing power to inspection capabilities. A simple, effective cooling mechanism also ensures long tank life. Loma’s X5C features an easy to use eight inch intuitive touch screen. The X5C PC has been migrated to a Windows Embedded Standard operating system which ensures continued support from Microsoft. It has a high speed USB port and a simple Ethernet connection for easy outputting of reports. “The Loma X5C X-ray machine runs on a 24/7 basis and requires little or no attendance by staff,” adds Aaron. “It is easy to install and simple to operate plus needs little maintenance. “The overall service from Loma is excellent and I would happily recommend the company and its products to other food manufacturers,” Aaron concludes.